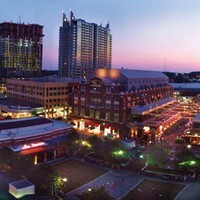 The District: Serving as the heart of the 138-acre redevelopment and located along a mile of interstate frontage, The District consists of one million square feet of open-air retail and entertainment, including six mixed-use retail buildings with entertainment, shops and restaurants. The Commons: This mix of apartment buildings, town homes and high-rise condominium towers offer an opportunity to live in close proximity to Atlantic Station's retail and office districts. The Village: Anchored by the first IKEA store in the Southeast, with residential homes across the street, The Village provides a great place to live and shop and serves as the neighborhood's meeting place. Parking: There is a three-story parking facility located underneath The District, and metered street parking is also available throughout The District. MARTA: The Atlantic Station free ride shuttle leaves from the Arts Center Station and is no cost to riders. The shuttle runs along the 17th Street bus-only lane from the Arts Center Station to The Flats and IKEA - making stops at the designated MARTA bus stops in addition to other stops. The shuttle leaves every 15 to 30 minutes daily from 5 a.m. to 1 a.m. Please note that the shuttle no longer enters the retail district.